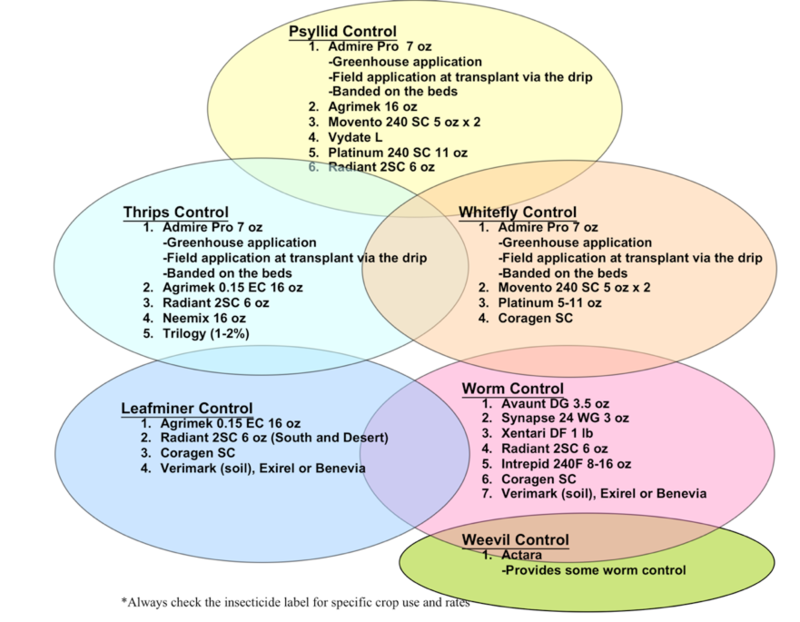 A low-input IPM program for controlling potato psyllid in California bell peppers, tomatoes and potatoes includes selecting pesticides to match the pest population present and using materials with the least detrimental effects on beneficial insects. Each circle indicates an optimized IPM rotation for that particular pest. Numbers indicate order of application within the rotational strategy and do not imply efficacy (higher number ≠ greater efficacy). When circles overlap, the rotation is expected to be effective against both pests. When a material appears in multiple circles, it can be expected to function for control against both (all) pests. When there is no material in common between two circles, it may be necessary to make an additional application using a material from each of the pests’ circles (rotation). Always check the insecticide label for specific crop use and rates.